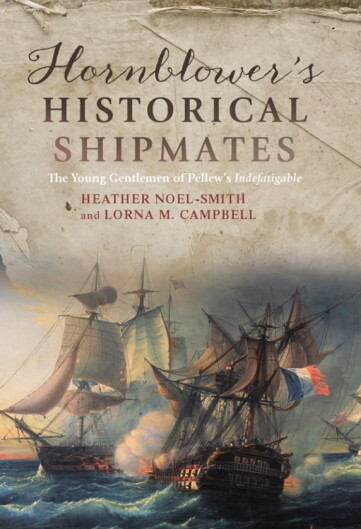 We have heard from Boydell & Brewer (no relation) who are just publishing “Hornblower’s Historical Shipmates: The Young Gentlemen of Pellew’s Indefatigable“. This book promises well! – it may ring a particular bell with members who heard Ron Meister’s fascinating presentation of Hornblower’s historical hermaneutics in Stockholm. A fascinating account of varied careers, providing a rich snapshot of the later eighteenth-century sailing navy in microcosm. This book sets out the lives of seventeen ‘young gentlemen’ who were midshipmen under the famous Captain Sir Edward Pellew. Together, aboard the frigate HMS Indefatigable, they fought a celebrated action in 1797 against the French ship of the line Les Droits de l’Homme. C. S. Forester, the historical novelist, placed his famous hero, Horatio Hornblower, aboard Pellew’s ship as a midshipman, so this book tells, as it were, the actual stories of Hornblower’s real-life shipmates. And what stories they were! From diverse backgrounds, aristocratic and humble, they bonded closely with Pellew, learned their naval leadership skills from him, and benefited from his patronage and his friendship in their subsequent, very varied careers. The group provides a fascinating snapshot of the later eighteenth-century sailing navy in microcosm. Besides tracing the men’s naval lives, the book shows how they adapted to peace after 1815, presenting details of their civilian careers. The colourful lives recounted include those of the Honourable George Cadogan, son of an earl, who survived three courts martial and a duel to retire with honour as an admiral in 1813; Thomas Groube, of a Falmouth merchant family, who commanded a fleet of boats which destroyed the Dutch shipping at Batavia, capital of the Dutch East Indies, in 1806; and James Bray, of Irish Catholic descent, who was killed commanding a sloop during the American war of 1812. Heather Noel-Smith is a genealogist and a retired Methodist minister. Lorna Campbell is a digital education manager at the University of Edinburgh and an education technology consultant. They are both independent researchers.